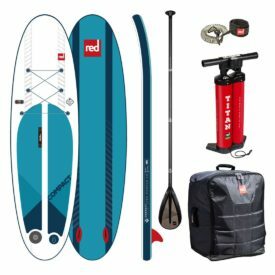 Once again, Rueben from SUPBoarder Magazine gives us a detailed look at the 2017 Deluxe and Zen inflatable paddle board packages. The main difference is the board’s construction, but there are small package differences too. Welcome back and in this video we’re going to do a comparison video of the Deluxe and the Zen Starboard Blend range looking at the construction but really what it paddles like on the water and what are the big differences between the 2 boards. 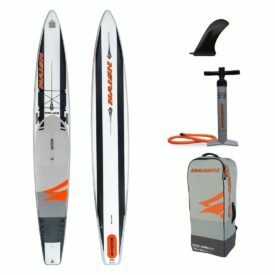 Starboard say the Blend is an ultimate transportable flat water to wave cross over with a wide tail for increased stability, straight line outline and a pulled in nose. Basically meaning it’s a really good all round board for all round paddlers and still has enough glide to take you places. So I know many of you out there might be slightly confused with the whole Deluxe and Zen construction thing and what you get in the package. We have done a first look video where we unpacked these boards out of the boxes, and had a little look and went over stuff there in that video, but in this video we’re going to go over it in a little more detail. We going to over what it is really like to paddle on the water with these 2 boards. But first off, let’s look at the specifications. Both these boards are 11’2″ long by 32″ wide, the only difference in specification size wise is the Deluxe is 6″ thick and the Zen is 4.75″ thick. The price difference, the Deluxe is $1399USD and the Zen is $999USD (board only). So quite a big difference in price there. A big major difference between these two boards is the construction and the materials that have gone into these boards and also the R&D that is behind these two boards. Both the boards have changed since the 2016 ranges and they’ve upgraded their constructions, they’ve both got lighter and both got stronger but they are both made in very different ways. The Deluxe is made out of their Fusion Technology which is where they fuse all of the layers of PVC and drop-stitch, and multiple layers of PVC in one go, without any glue, so it’s way, way lighter and way stronger. The Zen is a more traditional way of making an iSUP, let’s say. It’s made with the traditional drop-stitch and layers of glue, PVC, layers of glue, but they have reduced the amount of glue they have used since the 2016 range. So this board is naturally heavier, this board comes in at 11.5kg (25lbs) compared to the Deluxe there which comes it at only 10kg (22lbs). And when you actually think about it, this board is thicker, got more material on it, that is quite a lot of a weight reduction compared to the two. So that’s the physical shell of the board but there’s multiple things stuck on the outside of the baords which make them different too. The Deluxe has a biax rail, as does the Zen down the side of the board but the Deluxe has a 3K carbon rail stuck on top of that as well giving it extra strength. There’s also a dual stringer which goes underneath the full deck pad of the Deluxe there. There is a PVC stringer on the Zen board which you can see, easily raised, over the top and bottom of the board going under the EVA deck pad. Starboard have really pulled out al the stops for the Deluxe version, they’ve put on the compression rail band, they’ve done absolutely everything they can and everything they know in the R&D that they’ve done, onto that board. The Zen is more of a stripped back version of that technology, still a lot of stuff on it, but not as much as the Deluxe. Some of the fixtures and fittings that are on the board are the same. The bungee tie down points are the same. The handles are the same. The valves are the same, and they’ve also got a handle/paddle holder at the back which is the same. The deck pads between the two are very different as well. The Zen has the more traditional crocodile EVA style deck pad and the Deluxe has the sort of checker plate deck pad. Definitely the checker plate deck pad offers you a little more grip, but there is not much in when you are just cruising and using the board for all round performance. And both the boards are finished off with a kick pad as well. So the outline shape of the boards are exactly the same and as Starboard was saying earlier, they are designed for the all round paddling. Being 11’2″ long they offer you a lot more glide than a standard say 10’5″ board would do. So still, it enables you to go on those long distance paddles, down the rivers, along the coast, but you can still bring it into the surf aspect and getting into the waves if you want to as well. 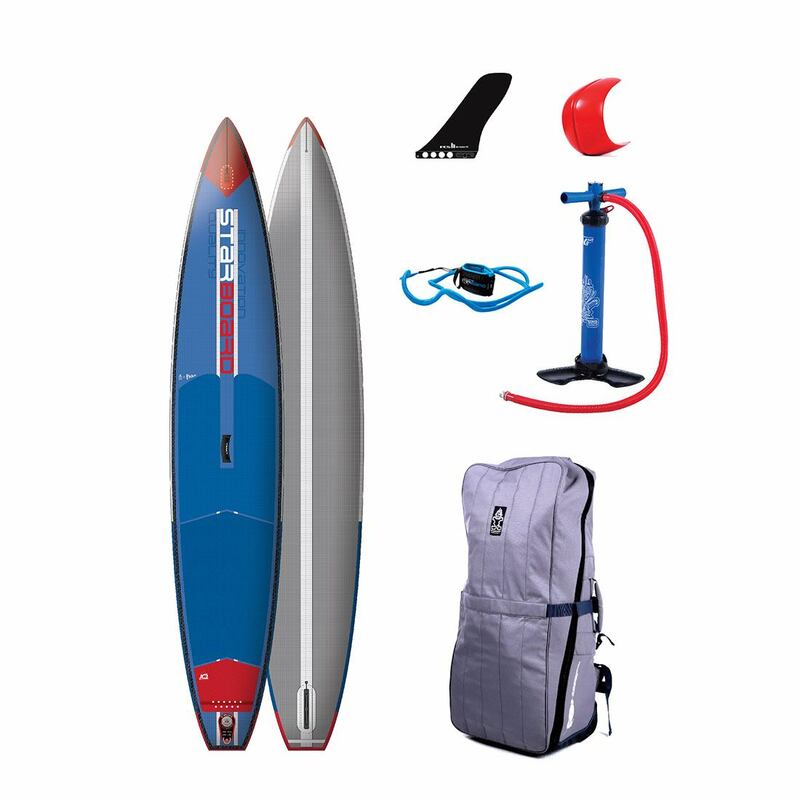 One thing to bear in mind with that is the fin setups between the two are very different, the Zen has the traditional Zen fin, the indestructible green thruster setup at the back of the board, where the Deluxe has a single US box with an FCS 2 quick release Connect fin which is way better for the longer distance cruising. 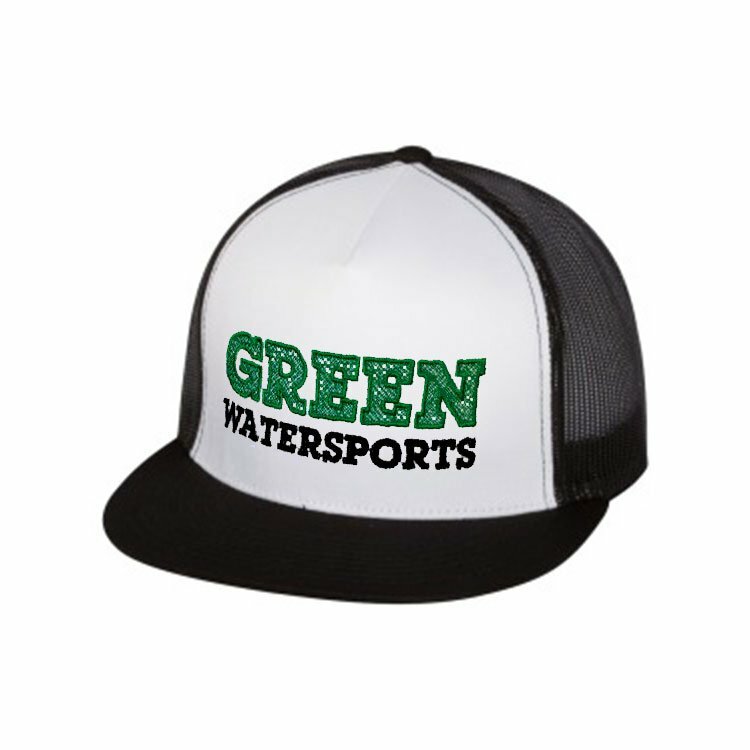 Because of the size and the fin and it’ll help you go in a straighter line. Moving on to the bags and the pumps. The bags are really vastly different between the two boards. 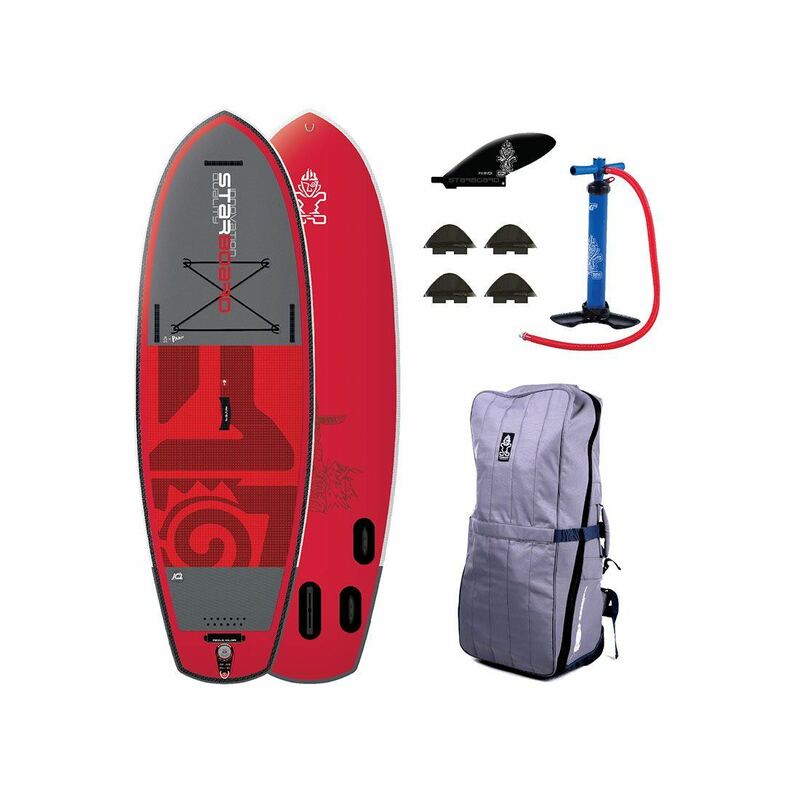 The Deluxe does come with a very nice hold all style, suitcase style of an iSUP bag where the Zen is definitely more of a simple, lightweight stuff sack board bag. Still has the wheels on the bottom and plenty of tie down points and a back pack but it hasn’t got the quality and the class of the full on Deluxe bag there. 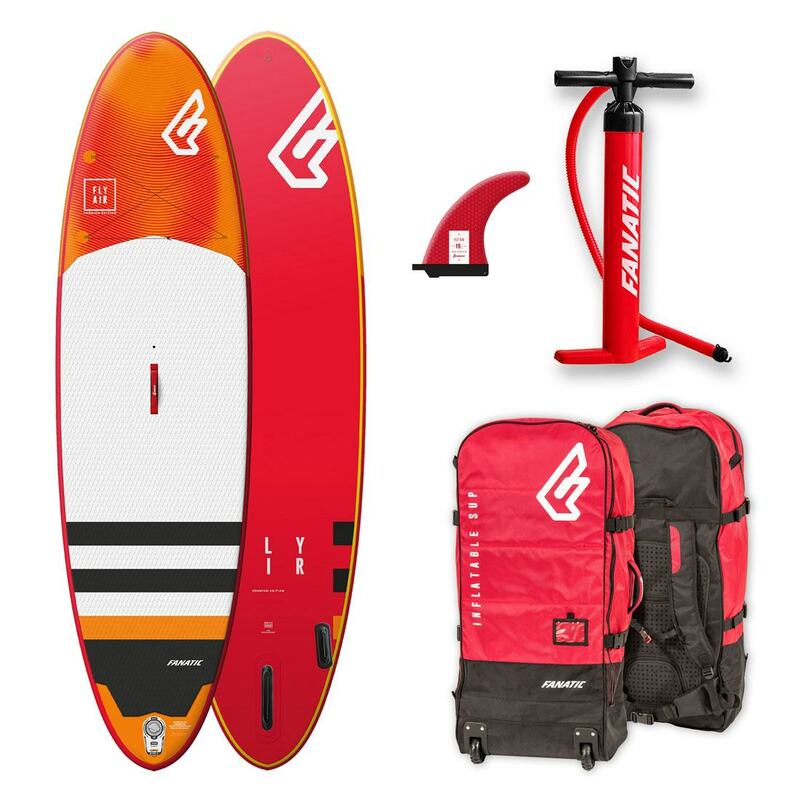 Both boards come with a free leash, which is a lightweight leash. For general paddling and flat water paddling, this leash is absolutely fine. And personally, I really enjoy it because it is so light weight, you don’t even know it’s on your leg. So that’s another thing that Starboard have put into the 2017 range. 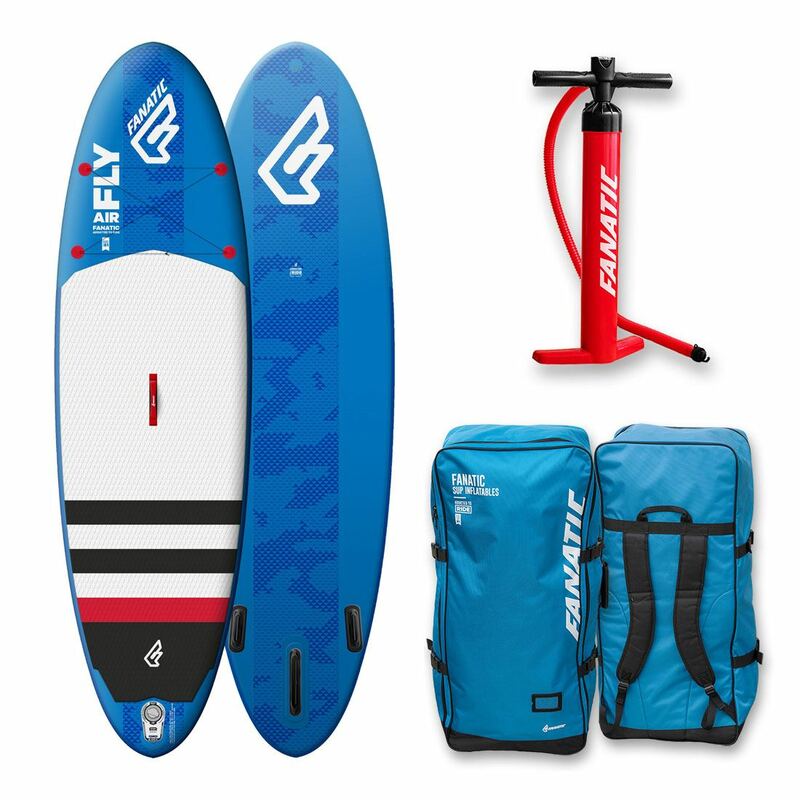 The pumps themselves and the physical chamber size and fittings are exactly the same, the only difference with the Deluxe, you get the detachable base which fits into the board bag way easier. The Zen has a fixed base system on the pump. So that’s the differences on paper, let’s move on to the SUPBoarder impressions and what we thought of the Deluxe and Zen. Moving on to the deflection test. These boards can be pumped up between 15 and 18 PSI, that is their recommend pump range. We pumped both these boards up to 16.5 PSI and we put them on our deflection test. The deflection test is where we put the board on a gap of 1.5m (5′) apart with a weight of 75kg (165lb) in the center and we measure how much the board drops. The Zen dropped 21mm and the Deluxe dropped 14mm. Obviously there are a few differences of why they are different numbers. Biggest one is the thickness. A 6″ thick board is going to be way stiffer than a 4.75″ board. But if you go back and look at some other 6″ boards that we’ve test on SUPBoarder, you will that the deflection on the Deluxe is lower than some of the other top brands and that has to be due to the biax rail, the carbon rail, the dual stringer, and the materials they’ve put on this board. So the board itself being 6″ is very stiff for a 6″ board. And this one here as well, 4.75″ still has a lot more stiffness than some other boards on the market at the same thickness. Paddling them on the water in flat general conditions. When you’re just mucking about with the board obviously you can feel the stiffness difference between the two boards, but general paddling they both paddle very much the same. There is a bit more straight line tracking with the Deluxe because of the bigger fin and a little bit less because of the Zen thruster fin setup. The big thing to remember straight way with the fins, if you are wanting to get into surf and have a few waves and really muck about on the beach with the family, you do not really want to be doing it on a board like the Deluxe with a hard fixed center fin. 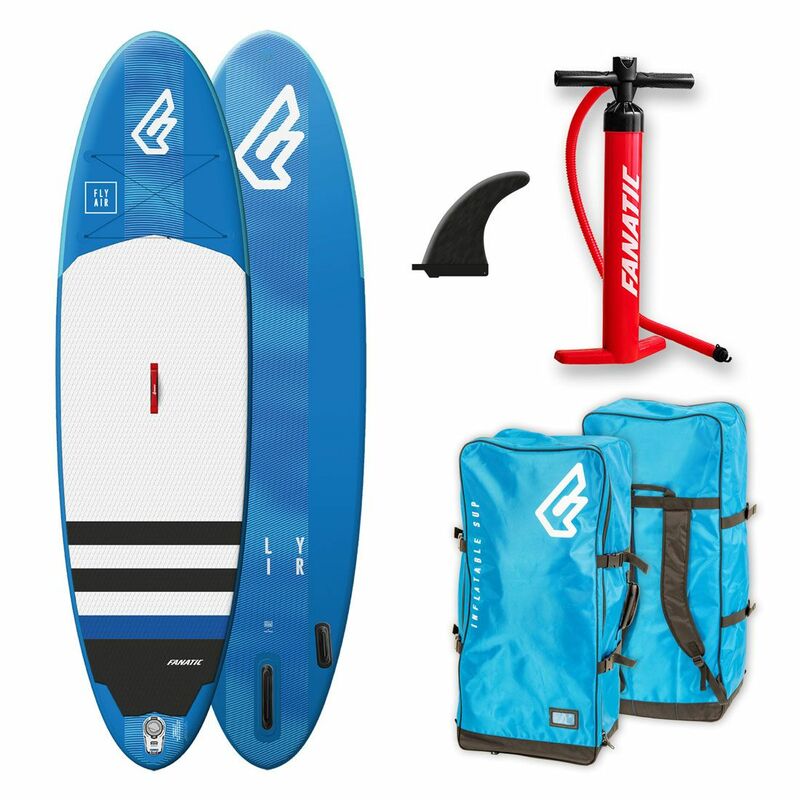 The Zen really offers you a way more forgiving board to use in all round conditions and definitely catch yourself a first wave without have to worry about going up the beach and knocking a fin off. The Deluxe certainly offers a heavier rider way more stability because of that thickness. And I think if you look at the Starboard catalog, Starboard rate the Zen taking a rider weight of 85kg (190lbs) and the Deluxe up to about 95kg (210lbs), which we completely agree with. So for general paddling, apart from the surf, they do feel very similar. The Deluxe you are slightly higher in the water and you can feel a little bit more detached from the paddling experience, but that really comes down to your body weight. If you’re a lighter rider, definitely look towards the Zen. Of the 80kg (175lbs) will quite happily suit you. If you are 80kg+ really look at the Deluxe you can get a lot more out of it because of the stiffness. I think the best way to think of the Deluxe, is you would probably buy that board for you to use, not general all round family board. If you weigh a certain weight, if you want to paddle rivers, certain distances, and maybe catch a few waves but you’re more aware of the fin, the Deluxe is the sort of board you’d look at. 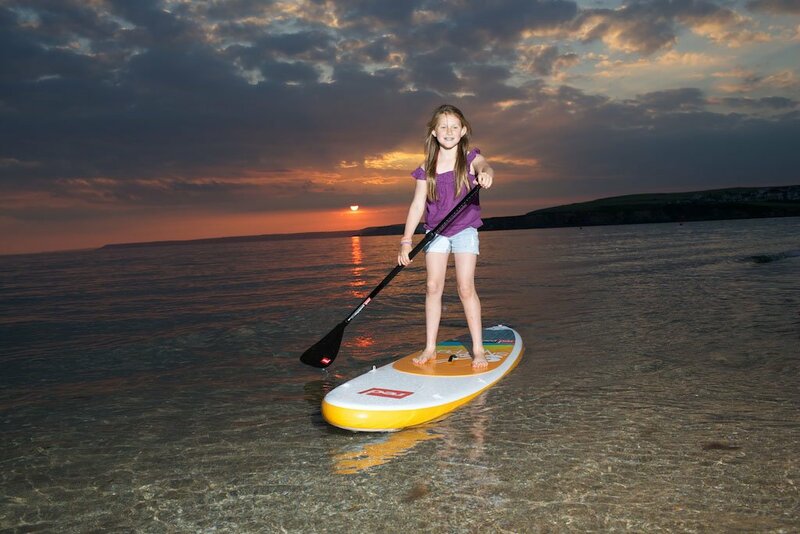 The Zen is just an all round, get the family out, have fun style paddle board. At SUPBoarder we do really like the Blend range because that extra length it gives you of that all roudn paddle board. 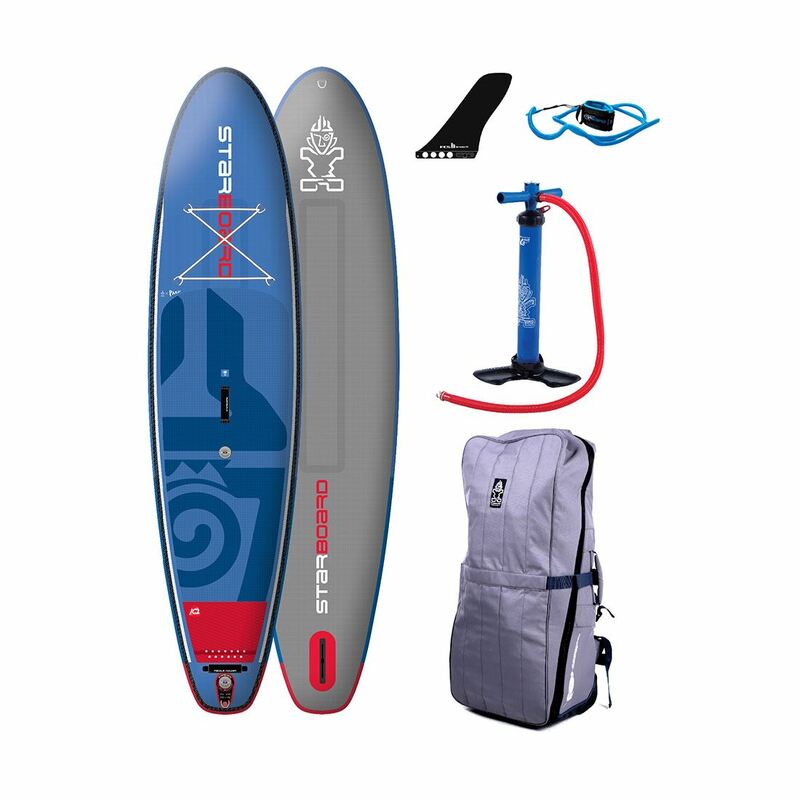 Longer than the standard 10’5″ paddle board but still has a 32″ width, nice and stable, offers you a good amount of glide but you can still take it out in the surf and muck about. A very good all round board and because Starboard have done the two constructions, it even matches and even wider range of paddlers and their paddling needs. While we may only have the Zen left in stock, you can still check out the Deluxe version in preparation for the 2018 model year boards due in early January 2018. 2014 Starboard Astro inflatable paddle boards on sale Detailed video review of the 2018 Starboard 12’6″ Touring Deluxe Double Chamber inflatable stand up paddle board A closer look at Starboard’s Deluxe Double Chamber Technology Review of the 2018 Starboard 11’2″ Blend Zen inflatable paddle board What is the difference between Starboard Astro Deluxe and Zen constructions? Posted on October 7, 2017 by Julian Kidd.